Waters named Women of the Year! REALLY! Waters has been calling for Trump’s impeachment nearly from the moment he took office in January. The representative participated in the anti-Trump Women’s March, which took place the day after his inauguration. Last weekend in Detroit, she led a crowd in chants of “Impeach 45” at the Women’s Convention, which was put on by the Women’s March organizers. “Donald Trump is the most dishonorable and despicable human being to ever serve in the office of the president,” Waters said at the convention on Saturday, according to Newsweek. The 79-year-old was confronted by a self-identified constituent concerning her rhetoric about Trump at an event in her Los Angeles district last spring. 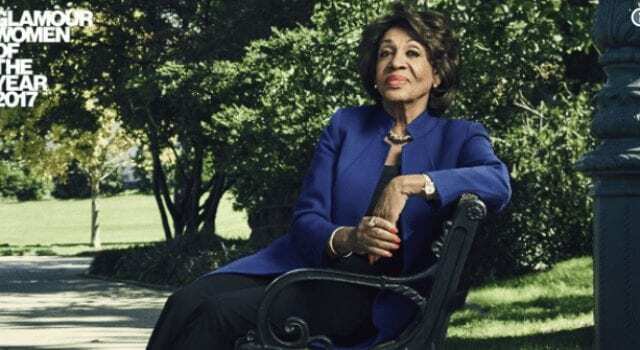 Waters responded that she “can’t stand” him and referenced an Access Hollywood video from 2005 where Trump was recorded making a lewd comment. The video had been released just weeks before the 2016 election. However, the constituent countered that Trump engaged only in talk, while former President Bill Clinton actually took part in lewd behavior as president. During an interview on MSNBC last month, the congresswoman said, “Republicans should step up to the plate and confront the fact that this president appears to be unstable,” she said. Previous articleClooney’s movie flops! Wonder why? Next articleMrs Obama says women protect men to much – Very Bad!